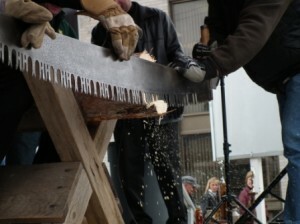 The Elmvale Maple Syrup Festival log-sawing contest is not for the faint of heart. Teamwork, communication and muscle power are required for success. Local dignitaries from several municipalities, come together in teams of two to participate in this exciting event. 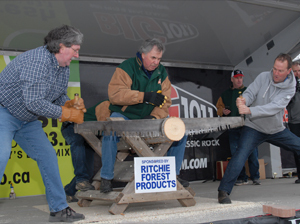 The pine log, donated by a local sponsor, is set up on the stage, and the referee for the event sits atop the log, to create stability. The 52 inch cross-cut saw is sharpened and oiled and the stopwatch is tested, to make sure it records the timings accurately. Most of the contestants are accustomed to working together in the political arena, but this requires a completely different set of skills. Each couple is allowed a short ‘test run’, after which they are advised to get ready and at the word ‘Go’ they begin the task of slicing off a section of the log in the shortest time possible. 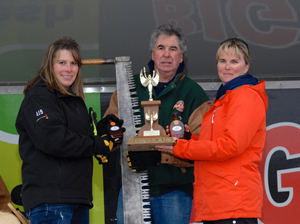 The winning teams are honored with the inscription of their names on the festival trophy, a bottle of delicious, local maple syrup and bragging rights for the coming year. Make sure to be at the main stage by noon to witness the excitement, following the introduction of our dignitaries.